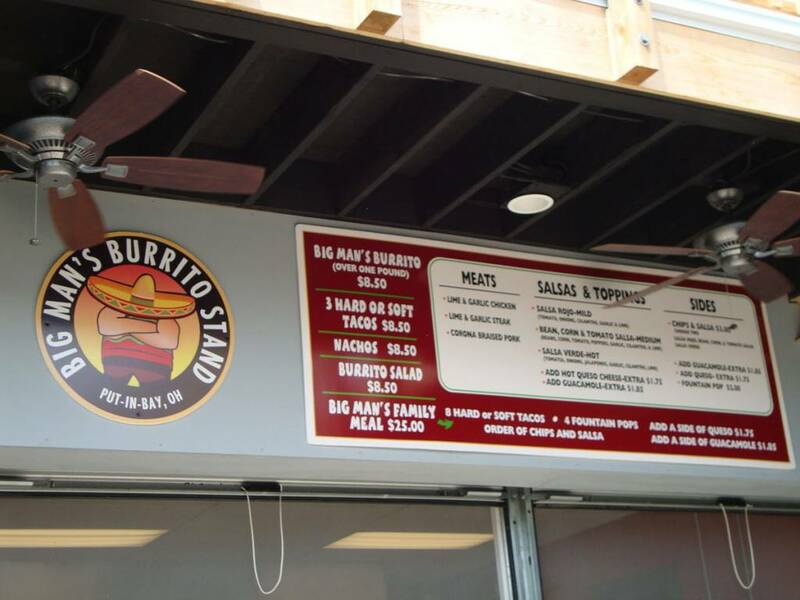 Big Man’s Burrito Stand on Put-in-Bay has burritos, nachos and more. Customers can personalize their selections, as each is made fresh to order. Additionally, there are several salsa options. The salsas are made in house, ensuring freshness and taste. Also, fresh produce tops off the savory selections. The location of Big Man’s is just behind Frosty Bar. Frosty’s has been a Put-in-Bay institution for decades. More importantly, their beer served in icy cold mugs is a must. Moreover, their piping hot pizza has been filling bellies on the Lake Erie Islands for generations. The Stoiber family prides themselves on running this guest favorite location. They decided to further their offerings by creating Big Man’s Burrito Stand and Frosty’s Backyard. The rear patio is a favorite place to catch a summer breeze. Also, a icy cold beverage completes the scene. So, the pizza options compliment the Mexican fare providing guests with many options. Menu items include the Macho Nacho’s, Buffalo Chicken Ranch Tacos and the Chicken Fajita Salad. Furthermore, all entrees are served with house fried tortilla chips. Three distinct salsas are sure to delight. Mild, hot and corn salsas highlight the menu. Lastly, tasty guacamole and cheese dip tantalize taste buds. These pair perfectly with the house made tortilla chips. A trip to Put-in-Bay and the Lake Erie Islands is not complete without a memorable lunch. With many options and flavors, Frosty’s and the Burrito Stand are a perfect choice. Groups will love the varied options. So, ensure all in the group leave happy and hungry with a stop here. Lastly, a day trip to Put-in-Bay is a good introduction to the island. However, an overnight stay is ideal. This affords guests an opportunity to experience all the island has to offer. Furthermore, with great hotels, homes and condos, guests have plenty of attractive options. See you at the bay soon!